The flagship of the fleet, the envy of the ball. 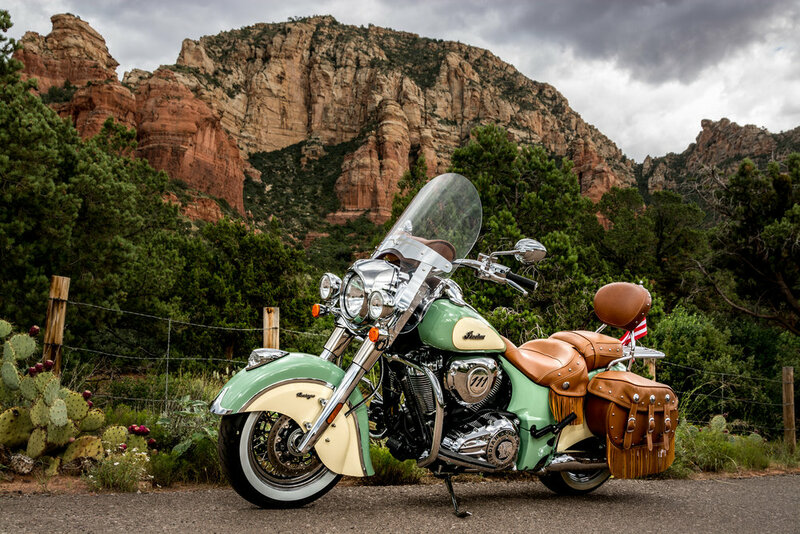 Willow is a 2017 Indian Chief Vintage with a 1811cc engine. With her willow green and cream paint design she captures the hearts of men, women, and children alike as she cruises the strip. She’s radioactive! 2015 Chieftain, she came custom made with all the bells and whistles. She likes the high-end material things in life. The faring on this bike is inspired by the locomotives of the 1950’s. Black and orange with eye catching chrome accents, BB is not your lumpy Mickey Mouse, she’s the Boss Lady. Subtle, sleek, refined, Sal D, the real greaser of the group isn’t your goopy, grody, party pooper. Take a ride on this 2016 Chief Vintage and you’ll have it made in the shade. You’ll be jazzed to ride him. The James Dean of the group, the ginchiest of the bikes. He’ll kill all the fellas with his adornments (Fringy is not shy about his love of fringe). Get ready to have a bitchin’ time cruising on this nifty bike. He’ll really razz your berries.